Soft and dense to shade or blend eye shadow or emollient-based products. 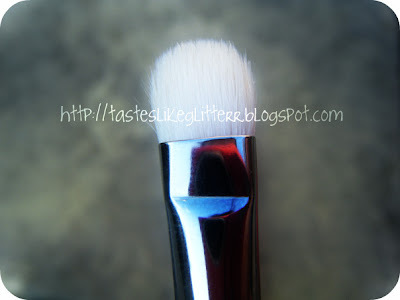 This brush has a tapered, rounded edge with smooth, firm, fine fibres. It can be used to build intense colour on the eyelid. M·A·C professional brushes are hand-sculpted and assembled using the finest quality materials. They feature birch, linden and ramin wood handles, nickel-plated brass ferrules. I'd heard a lot of talk about this brush in videos, on blogs etcetc and I'm not entirely sure why it has taken me so long to get hold of this. Before this I was using a 213 Fluff Brush, which is great and all but the bristles on that don't pack enough colour onto the lid, more on that in another post. The bristles on this are made from white goat hair, which is extremely soft. They are firm yet there is still a lot of give and they are not harsh to the eye at all. This has now become my every day go to brush for all over lid colour. Why? If you have it then you'll know how good it is. It blends well but most importantly picks up a lot of colour and transfers all of it too, with rarely any fallout. I just use this to lightly pat colour over my lid. The only times I've had extremely bad fallout is when using Urban Decay's Midnight Cowboy Rides Again, and that eye shadow leaves a lot to be desired. ¬_¬ I've used this every day I've put on my makeup since I got it and I wash my eye brushes after every use, there has been zero shedding. 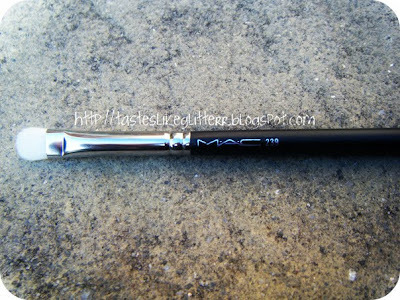 This is the perfect size for all over lid colour and a definite must have brush in my opinion.